A haven for those who seek privacy while vacationing in Tagaytay City, Joaquin's Bed & Breakfast is a retreat for weary souls looking for a quick escape from the hustle and bustle of Metro Manila. Conveniently located along Aguinaldo Highway, this... A haven for those who seek privacy while vacationing in Tagaytay City, Joaquin's Bed & Breakfast is a retreat for weary souls looking for a quick escape from the hustle and bustle of Metro Manila. Conveniently located along Aguinaldo Highway, this quaint B&B is only 2 hours away from Metro Manila, offering a quick getaway for city dwellers. With a breathtaking view, the hotel's rustic and homey design will make guests feel right at home in Tagaytay. Joaquin's Bed & Breakfast is also near restaurants overlooking the Taal Lake such as Leslie’s, and RSM Lutong Bahay. The hotel features 8 rooms where guests are guaranteed to experience utmost privacy and solitude. They are quaint like the hotel's facade, with a toned-down and relaxing design, thanks to its furnishings and quirky displays. Each room is fully air conditioned and complete with TV, and free WiFi connection for the guests. The private bathroom and toilet has a hot and cold shower, towels, and free toiletries. But the best feature of every room in Joaquin's Bed & Breakfast is the breathtaking view of the Taal Lake. Joaquin's Bed & Breakfast has a restaurant of its own, and like some of the well-known restaurants of Tagaytay, serves home-cooked dishes, especially the famous bulalo. It also has a good selection of wines. Tagaytay Wingate Manor is a tranquil haven for city-dwellers in the heart of Tagaytay that offers you the perfect escape from the frantic bustle of the metro. Tucked in a quiet spot along Magallanes Drive in Tagaytay City, Tagaytay Wingate Manor i... Tagaytay Wingate Manor is a tranquil haven for city-dwellers in the heart of Tagaytay that offers you the perfect escape from the frantic bustle of the metro. Tucked in a quiet spot along Magallanes Drive in Tagaytay City, Tagaytay Wingate Manor is situated near Lourdes Church and Ayala Malls Serin, Tagaytay's newest community lifestyle mall. It is about a two-hour commute from Metro Manila, which can be shortened if you are coming in via private transportation. The hotel's convenient address is ideal for those who like easy access to all that Tagaytay City has to offer. From the Aguinaldo Highway rotunda, turn right to the ridge road towards Nasugbu. As you approach the commercial strip with, Starbucks and Yellow Cab on your left, look for Magallanes Square to the right. Turn right at this corner to Magallanes Drive. Follow the road past Brahma Kumaris and Memory Lane; Tagaytay Wingate Manor is on the left side. Tagaytay's distance from Manila makes it the perfect weekend getaway destination. To make the most out of your Tagaytay escape, make sure to visit some of the city's places of interest like the Picnic Grove, Sky Ranch, and the People's Park to name a few. In addition, when in Tagaytay, forget about your diet and indulge in some comfort food at Pamana's, Cliffhouse, or Bag of Beans. Tagaytay Wingate Manor first opened on March 2011. The boutique hotel has around 24 rooms. Looking like a modern ranch set amidst the rolling pineapple fields of the countryside, the Tagaytay Wingate Manor makes the most of the fresh breezes by having open corridors and outdoor common areas. Rooms can accommodate twin to quintuple sharing arrangements and are fully fitted with international deluxe facilities. The rooms, which range from Standard Twin Room, Deluxe Room, Premiere, and Family Rooms (either regular or poolside), are neatly furnished in a contemporary style, with tile floors and walls and fabrics in deep earth tones. The rest of the hotel maintains this clean aesthetic all throughout. Each room is perfect for particular types of guest: The standard room is ideal for couples while the Deluxe and Premiere rooms are more for small groups. The no-nonsense interiors and generous allocations of beds in the rooms make it the recommended residence for business travelers and families alike. Couples also get a special treat when booking rooms as each suite comes with two free massages. But whether or not you are a couple, each room is inclusive of free massages for two. Each room also comes with a complimentary breakfast equal to the number of people allocated per room. Tagaytay Wingate Manor's comfortable guestrooms make you feel right at home. All 24 rooms are furnished with refrigerators and HDTVs programmed with satellite channels. The complimentary WiFi access lets you stay connected to the Internet, and the private bathrooms come with rainfall showerheads. Tagaytay Wingate Manor boasts a wide range of practical amenities and on-point services that let you enjoy a comfortable and convenient stay. The hotel has an outdoor pool for both kids and adults. Tagaytay Wingate Manor’s pool is topnotch and was designed with industry standard pumps and filter system, making sure that it is clean and ready for swimming all the time. It’s a great way to cool off and paired with Tagaytay’s cool weather, makes it relaxing and breezy. It also has a garden, ideal for holding events and banquets like birthday parties and wedding receptions. If you aren’t up for a swim, you can just chill at the garden poolside and enjoy the relaxing Tagaytay breeze while enjoying a good book or sipping on a nice cocktail. Guests don’t have to go far to dine on some affordable food as Tagaytay Wingate Manor has its own restaurant. The Manor Café offers casual dining for guests from 6:00 AM to 10:00 PM. They offer a wide array of quality dishes at reasonable prices in a modern comfortable setting, making dining enjoyable. They serve great breakfast hot meals that are perfect for the cold climate of Tagaytay. If you need to relax, The Manor Spa is available to provide you with relaxing massages and treatments. Tagaytay Wingate Manor is one of the very few hotels in the city to offer two complimentary massages for every night booked. Take advantage of this perk and unwind and rejuvenate while you are on vacation. You have the choice or a dry or oiled one hour massage to help release the tension and get you back in tip top shape. The front desk, although open at limited hours, is manned by friendly and helpful staff members that make sure that all your needs and concerns are addressed timely and efficiently. Tagaytay's rustic charm is best appreciated when you stay at an equally rustic accommodation that complements the splendid sights of this countryside destination. With its quaint ambiance, pleasant surroundings, and practical offerings, Tagaytay Coun... Tagaytay's rustic charm is best appreciated when you stay at an equally rustic accommodation that complements the splendid sights of this countryside destination. With its quaint ambiance, pleasant surroundings, and practical offerings, Tagaytay Country Hotel promises a most unforgettable Tagaytay experience for all who visit. Tagaytay is one of the favored weekend destinations among city dwellers because of its proximity to the metro. Only about an hour's drive or bus ride, it has a cool climate and scenic nature views that offer relaxation for guests who need a temporary break from the hustle and bustle of the urban jungle. Tagaytay Country Hotel is meters away from the bus stop at Olivarez Plaza, a convenient distance especially if you will be commuting to and from Tagaytay. It is just along E. Aguinaldo Highway, one of the major thoroughfares in the city. With that, Tagaytay's tourist attractions are easily accessible. Tagaytay Country Hotel has an understated charm that will make you feel right at ease. It has a simple design that instills an ambiance of tranquility that is fitting for your R & R escape. One of the distinct features of this hotel is the beautiful garden in bloom located in its grounds. It offers you a peaceful nature respite among the various flora and fauna. For your stay at Tagaytay Country Hotel, expect a balance of quality and value with its cozy rooms that come equipped with the essential amenities guests look for in a hotel. Whether you are traveling solo or with your loved ones, there are 68 rooms at Tagaytay Country Hotel you can choose from depending on your needs. They are categorized into four types: Economy, Suite, Deluxe, and Superior. All are air conditioned and fitted with comfortable beds for a good night's sleep. You'll also find that each of them has an en suite bathroom where you can enjoy a hot shower to battle Tagaytay's chilly climate. Cable TVs are also provided in each room for your entertainment, as well as telephones. At Tagaytay Country Hotel, you get the best bang out of your buck because it has a lot more to offer aside from its well-appointed guestrooms. Enjoy access to a host of convenient facilities and avail of the various services that the hotel offers for a more hassle-free and worry-free vacation. You don't need to spend a hefty price just to enjoy a dip in a swimming pool at a five-star hotel because Tagaytay Country Hotel has a pool of its own. 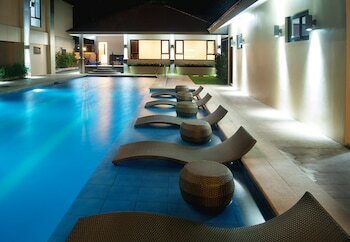 After a day's worth of exploring Tagaytay, freshen up by taking a plunge into the hotel's swimming pool. Another way you can unwind is by having a pampering session at Tagaytay Country Hotel's onsite spa, La Costa Spa. Relieve all the tension from your body by getting one of their signature massages. One of the best ways to experience Tagaytay is by tasting its local cuisine. Tagaytay Country Hotel's very own Country Café offers a wide range of sumptuous dishes for guests, including Tagaytay's signature dishes such as fried tawilis and bulalo. Open for breakfast until dinner, the restaurant has a built-in bar as well for guests looking to go drinking. Tagaytay Country Hotel's other advantage is its polite and accommodating staff that will assist you with your concerns with services like room service and laundry service, both of which are offered by the hotel. With Tagaytay Country Hotel's advantageous location, you won't have a hard time getting to the most popular attractions in Tagaytay. Olivarez Plaza, one of the top shopping destinations in Tagaytay, is only within walking distance from Tagaytay Country Hotel. Home to plenty of ukay-ukay shops, it is where fashionistas on a budget can shop for stylish clothes for bargain prices. Tagaytay is also a popular destination for pilgrims because of its beautiful and unique churches. Two of the popular religious attractions in Tagaytay are just a mere five-minute drive away from Tagaytay Country Hotel. The first one is the Our Lady of Lourdes Church. This church which is run by the Capuchin Order of the Franciscan Minors has a lovely candle chapel where you can light candles and offer your prayers and wishes. It is also a popular venue for Catholic weddings. The second one is Pink Sisters Convent. Featuring a gorgeous compound with verdant greeneries, the church has become famous for its pink-clad Sister-Servants of the Holy Spirit of Perpetual Adoration offering to pray for your all your intentions. Meanwhile, Tierra de Maria, which features a 50-foot statue of the Our Lady of Manaoag, is about an eight-minute drive from Tagaytay Country Hotel. Aside from a religious experience, Tagaytay also has lots to offer tourists. Ten minutes away from Tagaytay Country Hotel by car is Tagaytay Picnic Grove. It has one of the best views of Taal Lake, which families and friends can admire as they dig in to their delicious packed lunch. There are also plenty of exciting things to do there, including zip-lining and horseback riding. People's Park in the Sky is another Tagaytay park visitors simply cannot miss during their trip. Less than a 20-minute drive from Tagaytay Country Hotel, it is the highest point in all of Tagaytay and is a great place to go sightseeing. It used to be called "Palace in the Sky," with the "palace" pertaining to a mansion built during the Marcos administration, from where you can enjoy a sweeping view of the ridge and Taal Lake as well. An amphitheater is another interesting find at People's Park in the Sky. Picnics are also allowed at the park as there are available cottages that you can rent. You can also go horseback riding here. Earn as much as 317 points. Delight in the elegantly restored iconic rest house set to cater to sytlish and classy families and travelers who seek relaxation and comfort. Located at #48 Brgy. Iruhin Central, Tagaytay City ,the house boast a 3-decade-old brick and wood structure... Delight in the elegantly restored iconic rest house set to cater to sytlish and classy families and travelers who seek relaxation and comfort. Located at #48 Brgy. Iruhin Central, Tagaytay City ,the house boast a 3-decade-old brick and wood structure and holds collections of both fine antiques and upscale modern furnitures. Treat yourself to a relaxing getaway in Tagaytay to refresh your weary mind and calm your senses. As you take in this city's marvelous sights and sounds, let Tagaytay Vacation Rooms offer you the comfort you need for your vacation. Located along Kay... Treat yourself to a relaxing getaway in Tagaytay to refresh your weary mind and calm your senses. As you take in this city's marvelous sights and sounds, let Tagaytay Vacation Rooms offer you the comfort you need for your vacation. Located along Kaykulot Road in Barangay Sungay, Tagaytay Vacation Rooms is a modern lodging facility set amidst the backdrop of lush gardens. Featuring 3 floors, it offers quality services and facilities to make your stay convenient and hassle-free. With its location, it offers easy access to some of Tagaytay's most popular destinations. Rooms at Tagaytay Vacation Rooms can accommodate a maximum of 6 guests, making it the ideal choice for big groups of travelers. Each room features a minimalist design conducive to a good night's sleep. Featuring comfortable beds, each room has a private bathrooms that come equipped with toilet and hot and cold shower so you can freshen up. After a tiring exploration around Tagaytay, you can unwind at the Tagaytay Vacation Rooms' gazebo as you admire the lush gardens filled with a variety of plants and flowers. Only 2 hours away from via SLEX, Tagaytay City is one of the most favored tourist destinations south of Metro Manila. Travelers from all over come to this city in Cavite to breathe in its cool highlands air and take in the gorgeous sight of Taal Lake. Some of the popular sites to visit here include Tagaytay Picnic Grove, People's Park in the Sky, and Sky Ranch. Foodies will delight in the hot and savory broth of its signature dish, bulalo, which they can try in any of the countless roadside restaurants. Elegant Star Apartelle offers the perfect setting for a quick escape from the hustle and bustle of life in the metro. Located in Tagaytay City, Elegant Star Apartelle offers comfortable accommodations that are complimented with friendly and hospitab... Elegant Star Apartelle offers the perfect setting for a quick escape from the hustle and bustle of life in the metro. Located in Tagaytay City, Elegant Star Apartelle offers comfortable accommodations that are complimented with friendly and hospitable services to make you feel right at home. Elegant Star Apartelle has spacious and well-appointed rooms that come fully air conditioned. Each room has a TV with cable channels, a refrigerator, and an en suite toilet and bathroom with hot and cold shower. Wireless internet is also available onsite so guests can surf the internet at any time during their stay. Tagaytay is approximately a 2-hour drive from Manila and its proximity to the country's capital make it a favorite weekend destination by many who wish to have a change in scenery and to breathe in the cool and fresh air. Apart from the city's cool temperature and natural charm, Tagaytay also has a variety of interesting places that are worth discovering. You and your friends can go to the Picnic Grove to share good food and exchange stories with the captivating Taal Lake in the background. If you are travelling with your family, the Sky Ranch is the perfect destination that the kids and the kids-at-heart will surely enjoy. Tagaytay is also home to an array of restaurants that serve delectable dishes that will surely tickle your palate. You can choose to dine at Antonio's or at Pamana's. Afterwards, cap off a great meal with a warm cup of coffee from Bag of Beans or with a box of the delightful buko tarts from Rowena's. Tagaytay Vacation House is located along Kaykulot Road... Let the cool winds of Tagaytay City blow all your worries away and let Tagaytay Vacation House provide you with a relaxing hideaway in one of the most popular destinations south of Metro Manila. DM Residente Tagaytay is a vacation house that is ideal for families or friends who want to seek a quiet respite away from the hustle and bustle of Manila. Located along the Canyon Woods - Laurel Road, just a few kilometers away from Sonya's Garden, DM Residente Tagaytay is about a 2-hour drive from Metro Manila, with free parking spaces available onsite. It is also accessible to regular modes of transportation like the Nasugbu-bound buses from Manila. Tricycles and/or vans available at the Arc of Nasugbu can take you to the guesthouse. DM Residente Tagaytay features practical facilities and amenities that ensure a convenient and hassle-free stay for you. This vacation house has 3 fully air conditioned bedrooms, with TVs, toilets and baths with hot and cold showers, towels, and other bath essentials. It also has a garden and even a kitchen where guests can prepare their own meals. Tagaytay's cool temperature, numerous dining options, and accessible location are some of the reasons why it is the preferred destination for those who want a quick escape from the urban jungle. Thirty minutes away from DM Residente Tagaytay is Sky Ranch, a mixed-use commercial development with exciting rides and attractions that both the young and the young-at-heart will enjoy. A couple of kilometers further from Sky Ranch is the Tagaytay Picnic Grove, another favorite destination wherefamily and friends enjoy their meals together while admiring the magnificent view of the Taal Lake. Sonya's Garden is one of Tagaytay's favorite dining spots, along with Antonio's, Bag of Beans, and Cliff House. Earn as much as 431 points. Escape the demanding life in the metro even for just a weekend and go on a road trip to Tagaytay City where you'll experience a winning blend of luxury, comfort, and impeccable service at Country Chateau Hotel. Situated along J. P. Rizal Street in... Escape the demanding life in the metro even for just a weekend and go on a road trip to Tagaytay City where you'll experience a winning blend of luxury, comfort, and impeccable service at Country Chateau Hotel. Situated along J. P. Rizal Street in Barangay Maharlika West, Country Chateau Hotel sets a homey ambiance for all vacationers in Tagaytay City with modern facade and warm and brightly-lit interiors. More than just a relaxing place to stay, this posh hotel provides convenience for business travelers with facilities consisting of a function room and a business center. Leisure travelers will also delight in the plethora of recreational facilities offered onsite. Country Chateau Hotel has a roster of 12 comfy and spacious rooms fitted with modern amenities like air conditioning, flat screen cable TV, and minibar. The attached bathrooms come with toilets and heated showers while bath essentials and towels are provided at your disposal. You can enjoy daily breakfasts inclusive of the room rates. WiFi internet can be accessed for free from all guestrooms and in public areas around the property. Country Chateau Hotel ensures that guests have a pleasant time courtesy of the in-house recreational options. Swim a few laps in the outdoor pool or have a relaxing session with its range of massages and spa treatments. If you're hungry after a productive day, look no further for a bite to eat as the hotel's own restaurant that serves a great selection of delectable Pinoy eats to satisfy your cravings. 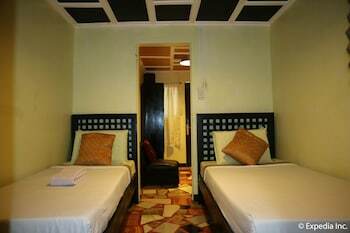 Whoever said that Tagaytay getaways are expensive hasn't been to Cool Breeze Hotel and Villas. This cozy hotel treats you to relaxing accommodations and excellent services even if you are on a shoestring budget. Cool Breeze Hotel and Villas is right... Whoever said that Tagaytay getaways are expensive hasn't been to Cool Breeze Hotel and Villas. This cozy hotel treats you to relaxing accommodations and excellent services even if you are on a shoestring budget. Cool Breeze Hotel and Villas is right along Airborne Street in Tagaytay City, just a kilometer away from Ayala Malls Serin and the Lourdes Church. The hotel is conveniently accessible to all kinds of transportation. For those going to Tagaytay via road trip, there are free parking spaces available onsite. 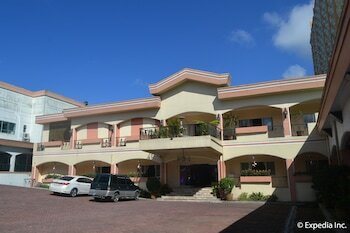 Cool Breeze Hotel and Villas features a 24-hour front desk, an in-house cafe, and free WiFi. The property is generally non-smoking but there are designated areas for smokers. Dry cleaning and laundry are just some of the services offered at the hotel. The rooms are well-kept and complete with amenities such as air conditioning and cable TV. The private bathroom is equipped with a shower. Room service is available at limited hours, while housekeeping is done daily. And if necessary, you can request for extra or rollaway beds, which come at a surcharge. 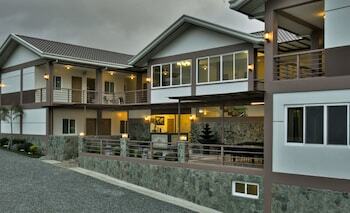 Set in Tagaytay, Luzon region, Royal thee Tagaytay is located 6 km from sky ranch. this property also provides restaurant. Free WiFi and room service are offered. Mediterranean House Restaurant & Hotel offers pleasant accommodations along with facilities and amenities for tourists exploring Cavite. Situated at Kilometer 74 Sitio Calo, Kaylaway in Alfonso, Cavite, Mediterranean House Restaurant & Hotel can be ... Mediterranean House Restaurant & Hotel offers pleasant accommodations along with facilities and amenities for tourists exploring Cavite. Situated at Kilometer 74 Sitio Calo, Kaylaway in Alfonso, Cavite, Mediterranean House Restaurant & Hotel can be reached after a little over an hour's drive from Metro Manila. Due to the hotel's convenient location, guests can enjoy the hotel's proximity to the numerous churches, beach resorts, and hiking trails in Cavite. Tagaytay City is also just a 30-minute drive away. True to its name, Mediterranean House Restaurant & Hotel has a Mediterranean style of architecture, evident in the design and decor of the facilities, the building itself, and the guestrooms. The hotel has a total of 14 fully air conditioned rooms equipped with satellite TVs, complimentary WiFi access, desks, and rollaway beds. Free toiletries and bottled water are provided. Hair dryer may be requested while infant beds are available for a surcharge. Guests can also order room service. Spend your leisure time swimming a few laps at the hotel's outdoor pool. Afterwards, relax with a drink at X Pool Bar, located by the poolside, which also offers Filipino cuisine dinners. Guests can also dine all-day at Leit Tiot, the in-house restaurant. Barbecue facilities are also available for those who want to grill their own food. Other recreational facilities that guests can take advantage of include a sauna, fitness center, a terrace, and a lovely garden. The hotel can also hold various events in its own function rooms. Guests can request for various services like laundry, ticketing, tour assistance, and babysitting. A two-hour drive from the bustling city of Manila is all that it takes to enjoy a place for tranquility. Unwind and relax at one of the country’s most popular tourist destinations, Casa Allegria. A bed and breakfast hotel lets you indulge in luxury... A two-hour drive from the bustling city of Manila is all that it takes to enjoy a place for tranquility. Unwind and relax at one of the country’s most popular tourist destinations, Casa Allegria. A bed and breakfast hotel lets you indulge in luxury while being delighted with Tagaytay’s breath-taking view. An ideal place for families, friends, or even partners to spend quality time together without worrying about the hustle and bustle of the city. Earn as much as 536 points. Earn as much as 1090 points. When you stay at Hotel Monticello in Tagaytay, you'll be within a 5-minute drive of Summit Ridge Promenade. This 4-star hotel is 7.7 mi (12.4 km) from Picnic Grove and 21.3 mi (34.3 km) from Enchanted Kingdom. Make yourself at home in one of the 41 air-conditioned rooms featuring refrigerators and LED televisions. Complimentary wireless Internet access keeps you connected, and cable programming is available for your entertainment. Private bathrooms with shower/tub combinations feature rainfall showerheads and complimentary toiletries. Conveniences include phones, as well as laptop-compatible safes and desks. Don't miss out on recreational opportunities including an outdoor pool and a fitness center. This hotel also features complimentary wireless Internet access, concierge services, and a banquet hall. Satisfy your appetite for lunch or dinner at Cafe Mercedes, a restaurant which specializes in international cuisine, or stay in and take advantage of the room service (during limited hours). Unwind at the end of the day with a drink at the bar/lounge or the poolside bar. If what you're looking for is a conveniently located hotel in Tagaytay, look no further than The Concierge at Wind Residences Tagaytay. From here, guests can enjoy easy access to all that the lively city has to offer. With its convenient location, th... If what you're looking for is a conveniently located hotel in Tagaytay, look no further than The Concierge at Wind Residences Tagaytay. From here, guests can enjoy easy access to all that the lively city has to offer. With its convenient location, the hotel offers easy access to the city's must-see destinations.